Edgar Degas was a passionate observer of nineteenth century Parisian life. Dancers, bathers, sportsmen, and friends all became subjects of Degas's search for a unique vision of modernity, one that would bring together daily life and a deep commitment to art and draftsmanship. Often his subjects were women caught in between the primping and posturing that defined their increasing public presence in society. Conversation at the Racetrack is one of a series of breathtaking pastels that Degas created from the mid-1880s to the early 1890s of women leaning over a railing at a race-track and absorbed in casual conversation. Here, Degas eliminated any suggestion of the equestrian context in favor of the unassuming poses of the three women, each defined by a vigorous black underdrawing. The composition is bisected by a red railing that runs diagonally from side to side, taking its cue from Japanese art, which often thrust figures into shallow, flat spaces and seemingly awkward poses. 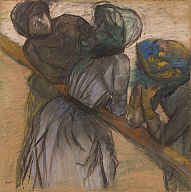 The middle figure in Conversation at the Racetrack has been identified as Degas's friend the American artist Mary Cassatt, who often posed for him in millinery shops and other public places. However, the woman at the left also resembles Cassatt, suggesting that, as in other pastels of this period, Degas had her pose in similar clothes for all three figures, thereby merely affecting an observed scene in favor of a staged composition. The most striking difference between each figure is the vibrant colors of the veils that adorn their bonnets, an opportunity to employ to astonishing effect the sumptuous hues and textures of pastel crayons. Excerpt from Building A Masterpiece: Milwaukee Art Museum. New York: Hudson Hills Press, 2001, p. 187. Entry by Kristin Makholm. Lloyd, Christopher. Impressionism: Pastels, Watercolors, Drawings. Milwaukee, Wisconsin: Milwaukee Art Museum, 2011, p. 169, color pl. 25, color detail p. 56. Milwaukee Art Museum News, February 2005, no page number, color illus. Andera, Margaret, Nonie Gadsden, Britt Salvesen, and Laurie Winters. Collection Guide: Milwaukee Art Museum. Milwaukee, Wisconsin: Milwaukee Art Museum, 2004, pp. 54, 73, cat. 90, color illus. p. 54. Milwaukee Art Museum. Building a Masterpiece: Milwaukee Art Museum. New York: Hudson Hill Press, 2001, p. 187, color illus. Goldstein, Rosalie, ed. Guide to the Permanent Collection. Milwaukee, Wisconsin: Milwaukee Art Museum, 1986, pp. 90–91, b/w illus. p. 90. Milwaukee Art Center. Personal Selections from the Mrs. Harry Lynde Bradley Collection. New Orleans: Bradley Family Foundation, 1975, color illus. p. 3. Milwaukee Art Center. The Collection of Mrs. Harry Lynde Bradley. Milwaukee, Wisconsin: Milwaukee Art Center, 1968, cat. 6, color illus. p. 11. Impressionism: Masterworks on Paper, Milwaukee Art Museum, October 14, 2011–January 8, 2012. The Collection of Mrs. Harry Lynde Bradley, Milwaukee Art Center, October 25, 1968–February 23, 1969.